Sirion loses its electricity & bump starting – HubNut – celebrating the average! 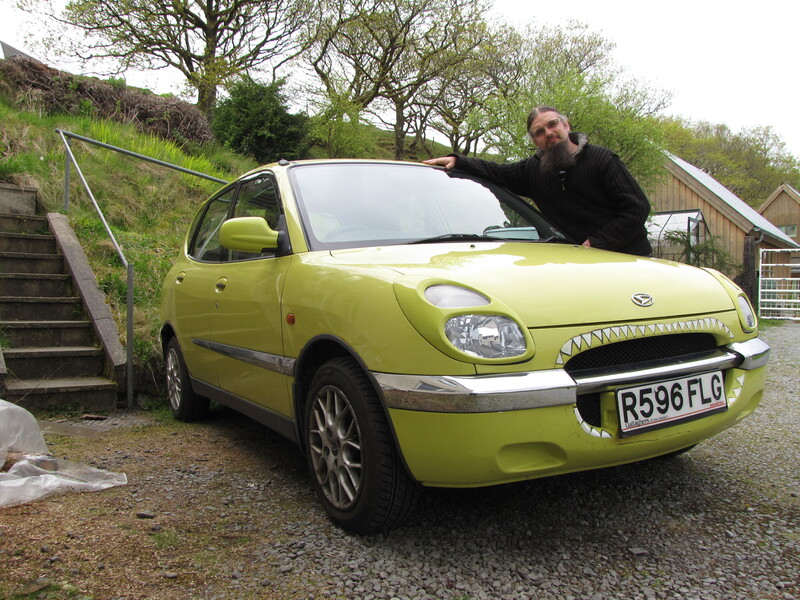 What was really silly with the Sirion is that I’d pulled into a lay-by to fiddle with a camera. I turned the engine off but forgot about the headlamps – it was a murky, wet day so I’d turned them on. As I didn’t get out of the car, the headlamp warning didn’t activate. After what I’m sure was only five or six minutes, I went to restart the engine and got that awful slow-starter noise. Bother. It wouldn’t turn the engine quickly enough for it to start, and then it quickly wouldn’t turn the engine at all. I didn’t have my mobile phone with me, so I was faced with either a long walk home in the rain, or bump starting it. Bump starting a car with a catalytic converter is seen as a bit of a no-no as it can in theory poison the cat. I didn’t really care. I just wanted to get home. Why don’t modern cars have starting handles? The ground was flat and the lay-by was not very long – and also had a car parked in it for extra danger. After four attempts, I had utterly failed to get enough momentum up. After bashing my shin as I attempted to quickly leap aboard, I was annoyed. Perhaps that enabled me to push the car a bit more quickly. As the car rolled, I selected second gear, turned the ignition on and briefly dipped the throttle pedal. Fully releasing it I had learn just stopped the car! It was enough. Only just, but the little engine purred into life! Phew. I drove home and pondered the reasons for the electrical fail. A few minutes of headlamps should not a battery flatten. Was it actually charging? 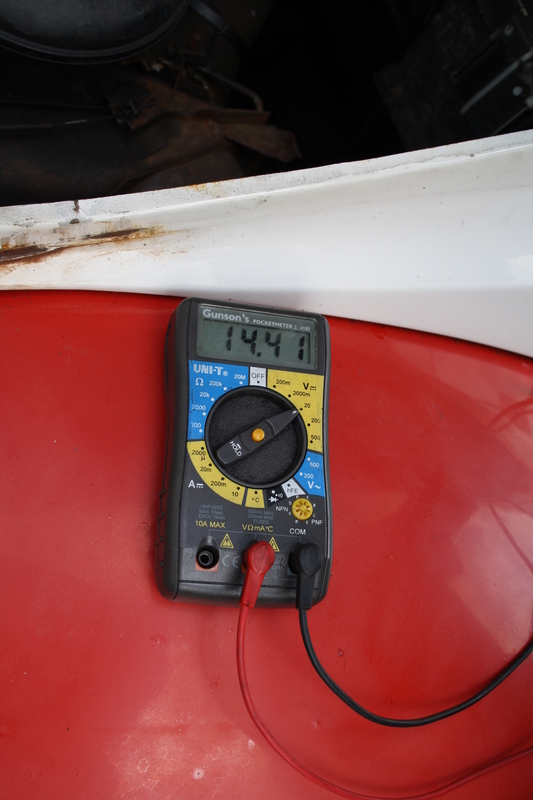 The fact that I got home suggested it was, and a multimeter across the battery terminals confirmed this – 14.2 volts. A healthy number of volts in a 12 volt system. Certainly, the car was happy to start on its own without further bumpery. So, the likely candidate is the battery. It’s a tiny battery on the Sirion, so its capacity is not astonishing. In the days of constant churning before an engine caught, this might have been an issue, but Japanese cars seem to start very nicely indeed. I suspect this one might be the original though, so it may be reaching the end of its life. That happens. The big test will be next winter, when the weather turns cold again. I’m not planning to replace the battery until I have to though, but will certainly avoid leaving the lights on in future! Bump starting a car is a useful trick if the battery goes flat, but first, some warnings. Bump starting requires the car to be moving without the engine working. That means that the brakes will gradually stop working as the servo pressure reduces. Also, the steering will be much heavier where it is usually assisted. Plan accordingly, remember where the handbrake is. Also try to plan what happens if the engine still doesn’t catch. Have an escape plan that doesn’t leave you blocking a road! 1) Turn ignition on. This also ensures that the steering lock is free. Gearbox in neutral, handbrake off, use gravity, push or recruit pushers. 2) Once the car is moving, and a slow jog is probably enough pace, select second gear and GENTLY ease up the clutch. You don’t have to jolt it. Once the engine catches, dip the clutch and bring the car to a halt. Simple! Further warnings. There have been rumours of diesels shattering their clutches during bump starting, which emphasises the need to be gentle with the clutch release. I’ve done it enough times with diesel BXs to regard it as not an issue. I’m not sure some modern cars can even be bump started. A good reason to avoid them. Naturally, bump starting on the road is fraught with danger! Especially if the battery is so flat that you can’t deploy hazard lights. You have been warned! Other options are jump starting, with safe jump leads or a jump pack, or using a starting handle if you’re lucky enough to have one! With jump leads, remember that the negative cable should go from the good battery negative terminal, to a good earth point on the car with the flat battery. That’s safer than connecting directly to the battery as sparks may ignite the gases a battery naturally produces. They really do go bang! With a starting handle, keep your thumb in. Don’t wrap your hand around the handle as it might kick back and break your thumb. Ouch!